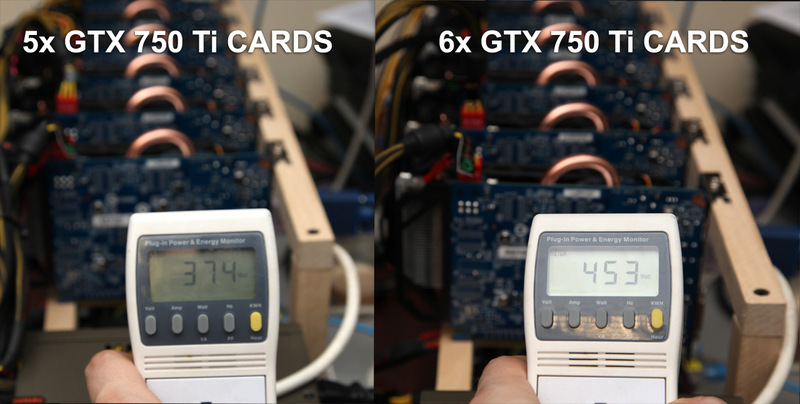 We have already published some interesting findings about the power usage of the new GeForce GTX 750 Ti graphics cards when used for crypto mining and recently we have built a 6-card GTX 750 Ti mining rig. 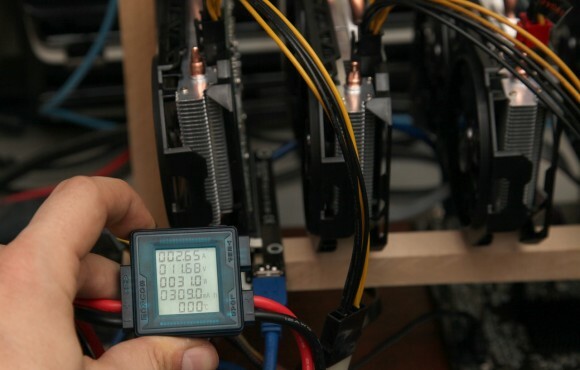 We have taken some time to also measure the power usage of the individual cards as well as the total power usage of the whole system in order to give you some additional details about what you can expect in terms of power consumption from such a mining rig. We have used Gigabyte GeForce GTX 750 Ti video cards (N75TOC-2GI) that do have an external onboard PCI-E power connector and we started by measuring the total power that goes to a single video card both trough the PCI-E slot as well as through the external PCI-E power connector with the help of a watt meter that is attached directly to the power lines going to the video card (using a powered extender). As you can see on the photo the total power used by the video card is about 31W (with the card running at +135 MHz for the GPU and + 610 MHz for the video memory). Note that this power measurement is on the 12V line from the PSU going to the video card, so it does not take into account the power efficiency of the power supply and as a result the total power used by the video card from the mains will be higher by something like 15-20% (depending on the PSU). Note that we have used a powered PCI-E extender with USB 3.0 cable for the data lanes. This extender takes all the power provided to the PCI-E slot of the video card through a 4-pin molex connector and supplies both the 12V and the 3.3V power that the card uses drawing only power from the 12V line (there is a voltage regulator to output 3.3V from the 12V input on the extender’s board). So what the wat tmeter shows is the total power going from the PSU to the video card and in the case of the Gigabyte GTX 750 Ti it was 31W. Again the total power usage from the mains will be higher as this measurement does not take into account the power efficiency when converting 220V/110V to 12V. So what is the situation with the total power usage per GTX 750 Ti video card from the mains? The easiest way to check that is to measure using a watt meter connected between a power socket and the power supply of the computer the total power consumption of the system with 6 cards and then disconnect one card and to measure again. The difference we got using this method was about 79W, though this is not for the video card only as it also affects a bit the overall power consumption of the whole system. Also note that the measured 374 Watt for the 5-card and 453 Watts with the 6-card setup are with the video cards overclocked to +135 MHz/+610 MHz. The results we’ve got with the cards running at the stock frequency were 367W with 5-cards and 432W with 6 cards or a 65W difference per card (total power used from the mains). This difference of 14 watts between stock and overclocked frequencies brings roughly about 40 KHS more in terms of hashrate for Scrypt mining (per card). Have in mind that our power supply used had an efficiency rating of about 80-85%, so this means that 15-20% of the total power used at the mains is actually wasted in the conversion between 220V/110V and 12V. Another interesting thing that we have noticed while testing the power usage and overclocking capabilities of the 6-card GeForce GTX 750 Ti mining rig was the total power consumption that we got for the system with the power target limit changed from the standard setting of 38.5W to the 65.5W. The watt meter showed an increase of power from the 453W with the 38.5W power target limit to 556W with the 65.5W power limit – about 100W increase with the same operating frequencies with a slight increase in performance of about 90 KHS total from the 6 cards or roughly a bit over 1W per KHS and in our opinion this is not worth the extra increase in power usage, so raising the power limit may not always be a good idea! Today we have built a 6-card mining rig using Gigabyte GeForce GTX 750 Ti (N75TOC-2GI) video cards that are based on the latest Nvidia Maxwell architecture promising very good performance for mining with low power usage. Our own initial tests of the GeForce GTX 750 Ti as a single card for mining have shown very promising results as well, so we’ve decided to see what we can expect from a mining rig and put together 6 cards with PCI-E x1-x1 extenders on an AsRock H81 Pro BTC motherboard with Intel Celeron G1820 CPU and 4GB of RAM running Windows 7. The result we’ve got from the 6-card mining rig for mining Scrypt with CUDAminer was a total of 1480 KHS as hashrate. Then after overclocking the video cards to the maximum stable result we managed to get (+135 MHz for the GPU and +610 MHz for the video memory) we’ve managed to increase the total hashrate to about 1615 KHS. We went as far as to increase the power target limit from the default 38.5W by modifying the video BIOS of the cards. With the modified video BIOS we have managed to get slightly more than 1700 KHS with a lot of extra power used by the whole system that made it not worth it the so little extra increase in the hashrate. Just to be sure that the x1-x1 PCI-E risers (not powered) might be the cause of slight performance drop we’ve replaced them with x1-x16 USB 3.0 powered extenders, though that did not change the performance we got from the cards. The Gigabyte GeForce GTX 750 Ti video cards we used for the mining rig do have an external PCI-E power connector, however it seems that unlike AMD graphics with OpenCL, when using Nvidia-based GPUs with CUDA for mining the use of a x1 PCI-E lane to access the video card does introduce slight performance drop and if you multiply the 10-15 KHS less per card for a 6-card mining rig it is not so little. So it is important to know that if you are going to build a GTX 750 Ti-based mining rig you will be getting slightly lower hashrate if you are using PCI-E extenders as compared to what you will get with cards inserted in x16 PCI-E slot directly. Also there is some variation between cards in terms of the maximum overclock supported that results in different maximum frequencies that you can achieve, for example if one card is able to do +135/+700 MHz for the GPU/VRAM the second one could be maximum +100/+600. This means that in a 6-card mining rig you will need to either sync all of the cards and use the same lower settings for overclocking the GPUs to ensure they will run stable or to not have the settings synced and find the maximum for each of the cards. Another interesting thing we have noticed is that while the use of T5x24 kernel for a single card with CUDAminer for best results, for a 6-card mining rig the use of T10x24 might sometimes provide slightly higher hashrate than T5x24, so you should try with both and see what works better in your individual case. 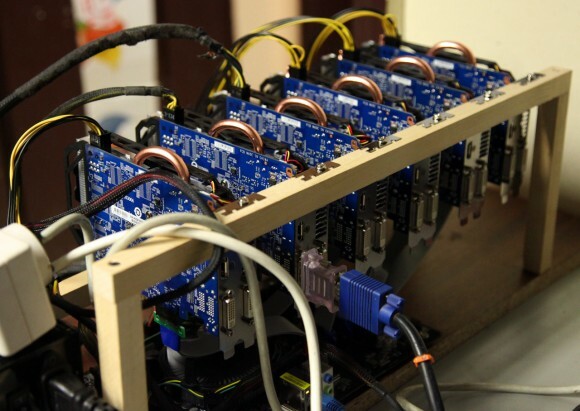 Tomorrow we are going to be doing some more testing of the 6-card GTX 750 Ti mining rig that will be focused mostly on the power consumption as this is also a very important thing when talking about crypto currency mining. 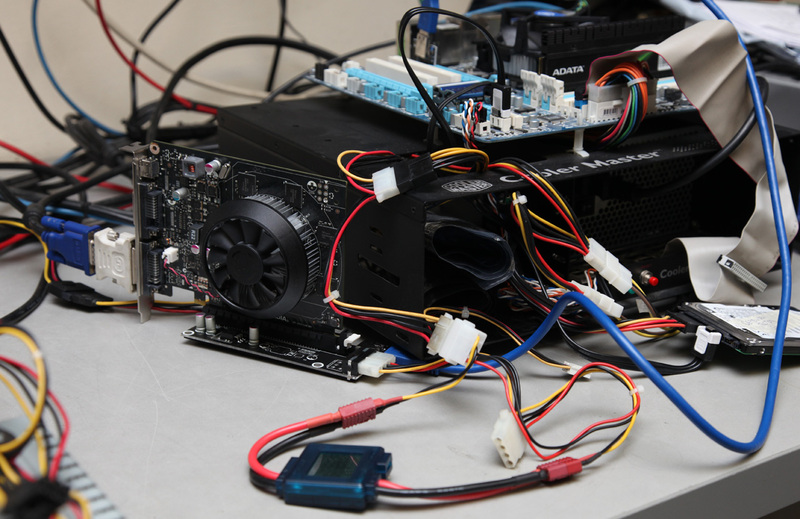 This made us dig into the matter a bit more in order to see how much power actually does a GeForce GTX 750 Ti draw from the motherboard (a reference GT 750 with no external PCI-E power connector). So we’ve attached a watt meter to the power line of an external PCI-E extender to see how much power is drawn by the GT 750 Ti card. The results we got were quite surprising, even though we knew that the default power consumption should fit in the 38.5W limit for the power target set in the BIOS. 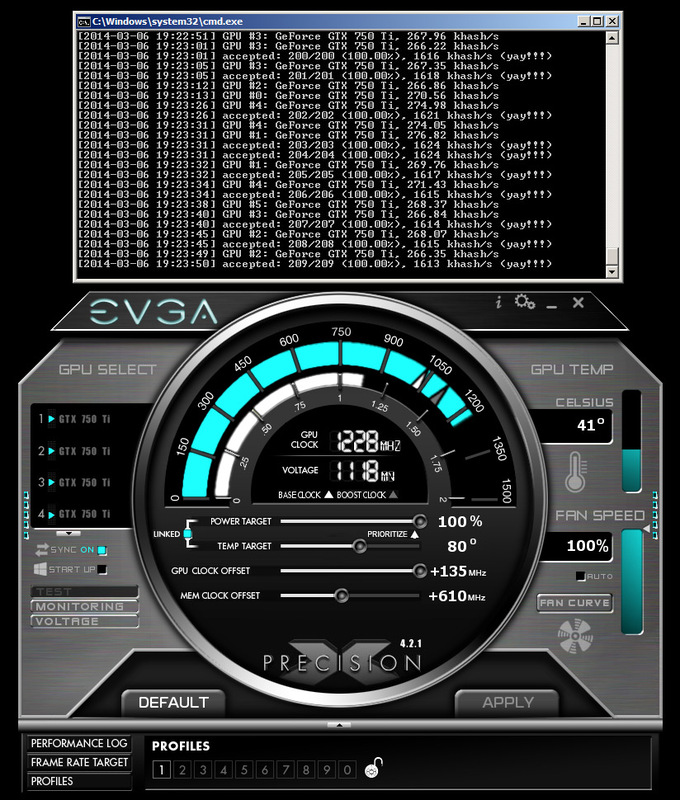 With the stock frequencies for the GPU and the video memory the GeForce GTX 750 Ti has shown to draw just about 28W ot power producing about 250 KHS hashrate for Scrypt mining. After getting the card overclocked to +135 MHz for the GPU and +650 MHz for the video memory the power consumption has risen a bit to about 34W average with a hashrate of about 300 KHS for Scrypt crypto mining. So if you were calculating the power usage of GTX 750 Ti as 60W in order to see the ratio of hashrate per Watt of power, then you should rethink how you calculate it now. Note that this is the actual power that goes from the PSU to the video card, the real power consumption with a 80 Plus certified power supply that provides 90% efficiency for example would rise with 10% to about 30W (stock) and 37W (overclocked) respectively as the actual power drawn by the card from the wall socket.